I took a picture of all the window displays outside of Selfridge while we walked through Oxford street. They were so beautiful and planetary themed. My favorite is what seems to be Mars, the god of war. And the one with feathers behind it is my least favorite… it felt very strange. For example: why is he holding the bow like that? And the overall pose too, is very strange. Planets and stars are some of my faves and this was very aesthetically pleasing to me. Karl Lagerfelt’s store 😳 I didn’t know it existed! Our little demon dog in slumber. Sketch done with a black ink pen. A sketch from last year. We acted as models for each other while we drew and this is Lovisa (our dear Rapunzel) by the windows at the stairs between the third and forth floor of Schillerska. This is on A3 paper and unfortunately the biggest my scanner can take is A4, so it’s a bit cropped. Bringing you double illustrations today because I felt the urge to upload these. Running low on things to scan so hopefully I’m in the mood to draw today~ Have a lovely weekend! Leader of the Broken Hearts. "Be the wind through your hair. Be the siren in the air." How to: be a heartbreaker. How To Be A Heartbreaker. Popcorn in a cute (hard paper) box, a plastic mug (you could choose either a Mike, Sully or Art figurine to have on top) and the memory game-cards. 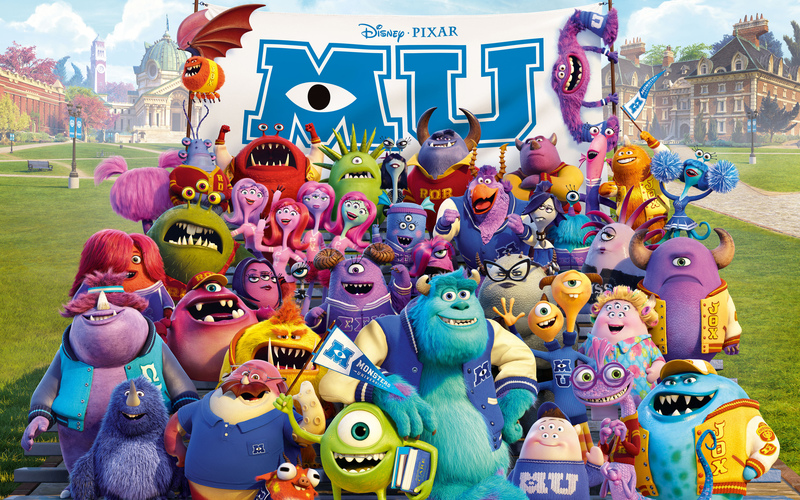 I liked Monsters University. It was a worthy prequel and to see tiny Mike was *AHHHH*… he was adorable °u° I laughed and almost covered my eyes when they almost lost the scare games (twice Ö^Ö)! Ps. Dean Hardscrabble is awesome *gay monster crush :DDD*… oh and she reminded me of the Grand Councilwoman in Lilo & Stitch! Robin made me super gorgeous! Going to meet him now and then we’ll go home to me (to see True Blood and later tonight we’ll make a fire). See ya later! This morning my illustration-class got the opportunity to visit an art studio. 15 people works in an apartment which they all share the rent on (and it makes it really cheap but cramped, they don’t work at the same time so it’s fine). It’s decorated with both their work and other comic works. It was very cozy! And the people working there has a lot of different styles. Some studies/have other work on the side and some works with it full time! The coolest thing must be that Max shares his desk with a guy that draws for DC comics! °w° So jelly! He works at night though so he wasn’t there. Fan of glitter, cute stuff and music/films/series/games. Follow if you're interested in getting notified when I upload new things! How did I get here agaaain?